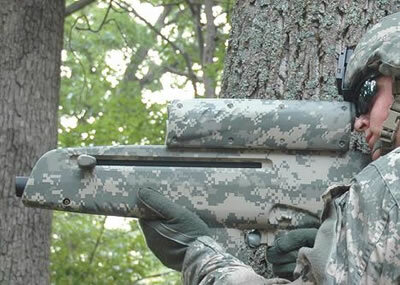 The XM25 Individual Air Burst Weapon is a weapon designed to engage a target hiding behind a wall or around a corner. It fires an air-bursting round at a target from 16 to 600 meters away with a highly accurate, 360-degree explosive radius. The XM25 will accept additional information from a soldier who wants to detonate a round above the head (for example) of a sniper hiding behind a wall. Once fired, the Alliant Teksystems round will take information "dialed in" to go off just after clearing the wall, still in mid-air. The XM25 is about as long as a collapsed M4, weighs about as much as an M16 with an M203 grenade launcher attached and has about as much kick as a 12-gauge shotgun, said Barb Muldowney, Army deputy program manager for infantry combat weapons. The semi-auto XM25 comes with a four-round magazine, though testers are looking at whether to increase the capacity to as much as 10 rounds. Some readers may recall weapons like the Lawgiver, used by Judge Dredd. 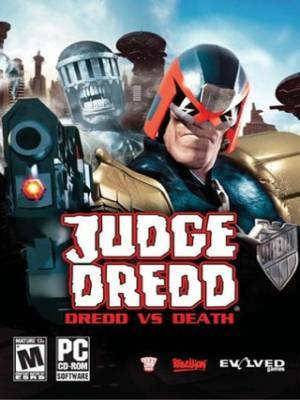 Judge Dredd, one of relatively few sci-fi gunmen to stick mainly with projectiles rather than moving to rayguns of some kind, does a bit better. Placing Justice Department boot to perp arse on the mean streets of Mega-City One, he uses implausibly reliable voice commandware to select different types of ammo for his Lawgiver pistol. In some of the stories he had extremely exotic rounds available, too - rubber ricochet bullets for tricky bank shots, high-explosive warheads, even infrared heat-seekers. But mostly it was just bullets. Other readers may think of the pump-action explosive-dispensing gun used in the recent Batman movie. More information can be found at Defense Tech and The Register; thanks to Vik for sending this one in.